Unlike the United Arab Emirates, with its Western-friendly, oil-money-flush megalopolises Dubai and Abu Dhabi, Saudi Arabia had, until very recently, resisted commercializing its major cities–particularly Mecca, site of Islam’s holiest relics, where millions of pilgrims flock yearly to perform the hajj. But the dramatic rise in global oil prices, and the construction boom across Saudi Arabia that followed, has finally caught up with the city where Mohammed was born. The boom is coinciding with Saudi Arabia’s efforts to diversify its economy, as well as its joining of the WTO in 2005, which forced the kingdom to open its retail sector to foreign companies. Still, it’s not surprising that multinational capitalism has honed in on this market: Lots of tourists on vacation, no matter how holy, tend to have a lax grip on their wallets. But, to pull off this remarkable transformation of Islam’s spiritual seat, including the destruction of many sites with sacred histories to make way for malls and luxury condos, the luxe brands of the world have had to lean on some unlikely allies. Irfan Al Alawi, the founder and former Executive director the Islamic Heritage Research Foundation and the most vocal opponent of the destruction of Mecca’s historic sites, lives in a house in Mecca built mostly out of salvage from demolished Meccan buildings: hulking wooden doors, intricately carved panels, and ancient stone columns. As the scion of a prominent Hadhrami family descending from the prophet Mohammed, the 40 year old historian has a significant amount of leeway to criticize the government–often joking with the secret police guards stationed outside his house to track his comings and goings (Saudis are thrown into prison on a daily basis for much less). Prominent clerics often speak out against conservation efforts like Alawi’s–in fact, it was Wahhabis who ran him out of his job in Mecca in the first place, after his increasingly bold criticisms of government policy irked the clerical elite. A pamphlet published last year by the Ministry of Islamic Affairs, endorsed by Abdulaziz Al Sheikh, the Grand Mufti of Saudi Arabia, and distributed at the Prophet’s Mosque, where Mohammed, Abu Bakr, and the Islamic Caliph Umar ibn Al Khattab are buried, reads, “The green dome shall be demolished and the three graves flattened in the Prophet’s Mosque,” according to Alawi, executive director of the London-based Islamic Heritage Research Foundation. This shocking sentiment was echoed in a speech by the late Muhammad ibn Al Uthaymeen, one of Saudi Arabia’s most prominent Wahhabi clerics, who delivered sermons in Mecca’s Grand Mosque for over 35 years: “We hope one day we’ll be able to destroy the green dome of the Prophet Mohammed,” he said, in a recording provided by Al Alawi. I am a student at New York University and I’m actually working on a globalization group research project on this exact article for my Global Affairs class. Part of my research is to get the point of view of critics of these actions presented in the article above. I’d like to know what Muslims think about globalization and how it is affecting Mecca and the holy sites within. Basically, I want to hear your feedback. Please feel free to start a dialogue as I’d love to hear what you all have to say, whether you are for or against all this. I look forward to reading the responses! Thanks! PS: Apologies for so many links. I’m a bit busy so have’nt got time to write a lengthy reply. I will try to post something in in a couple of days time. God willing. Many many thanks!! I really appreciate you taking the time to help! Saudi Goverment is on Quran and Sunnah in this matter. It is the order of Prohet(SAW) to keep equal the grave. Government wants prevent foolish people from Shirk and Sajdads before Graves. Anyone who destroys these sites in my eyes is running towards hell. Don’t let WAHABIS into your countries or else they will destroy all your heritage, like they have destroyed their own. 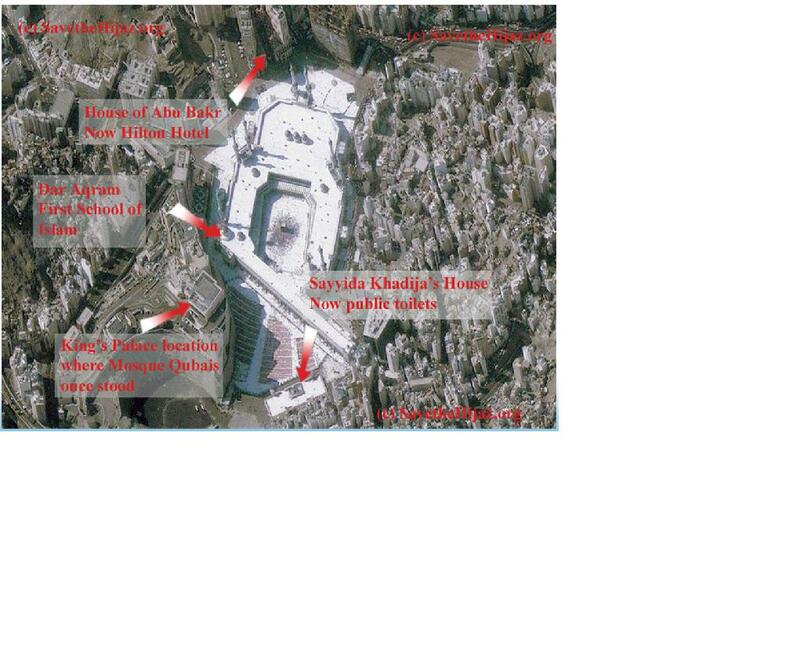 “The green dome shall be demolished and the three graves flattened in the Prophet’s Mosque. We hope one day we’ll be able to destroy the green dome of the Prophet Mohammed,” he said, in a recording provided by Al Alawi. How can any Muslim accept such disgraceful comments? Before any of the pseudo-Salafi crew says they actually agree with the above comments (Allah forbid); ask yourself, which pious people looked after the blessed grave of the Beloved Prophet (sall’Allahu Ta’ala ‘alayhi wa’aliyhi wa’sallam)? Wahabis were people who lived isolated in mountains and were thieves. These people were paid and encouraged by the British government to rebell against the Sunnis of that time to take control of Saudia (of course they were backed by the military power of the British and US, like they have done in Iraq, Afghanistan, etc). But to be able to rulled over Saudia, they had to BEND themselves in front of The Bristish and US, which of course they agreed to. Hence we can deduce that whatever the Wahabis are doing comes directly from their “master” the US and British. As for the brother who is telling to study hadith so as to justify the satanic plans of destruction of the holy places, i would say that he a very little knowledge of how to study a hadith. May Allah, the almighty guide these Wahabis in the right path and also help protect these holy places. Ameen. Wahabis are the people who don’t have understanding of deen at all (tafaqo fid din). The Holy verses of the Holy Quran, which have got shan e nazool in favour of idols and kufars, the wahabis try to implement these towards the Prophets and saints of Allah. This is gumrahi. The don’t read the Holy verses, which are in favour of Hazoor (SAW) and other pious personalities. The don’t have love for Ahle Bait, So they are Kawarij. May Allah save all the Muslim Ummah from their hetrodoxy. These “wahabis” are agents of the British Empire (New World Order) – its not enough that they have sapped the strength and money of the Ummah, they seek to conquer its very soul. The destruction of ancient Islamic sites is to erase the identity of the Muslims…. Saudi Arabia’s is “diversifying” its economy because the price of oil is about to be plunged by the central banks (by opening up HUGE reserves in Indonesia and Russia). This will shut down OPEC, and drive oil based economies into oblivion. From the the economic fallout, they intend to “rebuild” the culture of the Middle East. Globalization = making available the resources of the Earth for exploitation of the few. KSA = the whore of Britain/U.S./Israel. Wake up people!!! The Saudis have NO HISTORY, do you expect them to preserve history. The Wahabis have NO TASAWUF, do you expect them to care for religious places. A Saudi will go out of his way and spend millions to preserve his own house where he was born , but will conrete over the Prophet’s house. Let the TRUTH be told, and may ALLAH restrain them. Aslam O alaikum to all Muslim Brothers and Sisters. Almost all the allegation made by our Muslim Brother on Saudi Government and Wahabis are correct. But, simultaneously I would like to advise all Muslim brothers that in order to follow correct path of Islam, we should look within your self also. Muslim should not waste his/her time only criticizing other sect, but should keep up grading own Amal, so that other misguided Muslim should come under this right umbrella. By just proving that Wahabies are wrong, you can’t prove you are right. ** On the day of judgments, Allah SWT will not reward to “better among the worst” but to the best. ** On the day of judgments, we don’t have to answer Abdul Whab, Ahmed Raza Khan, Ashraf Ali Thanwi, etc…………… But to Allah SWT. ** A Muslim will not go to Jannah only because other is wrong, But he will be dealt according to his own Amal. ** A Muslim will not be dealt according to his sect or jamait but according to his own Amal. The cruellity of the House of Saud is obvious,,charging exhorbitant amount on every one who come to perform Haj and Umrah. The fact that Mecca belongs to all Muslims not them alone is something that they should understand..but being a barbaric warriors who only knows to ambush and destroy . Even the Kufur restored their heritage and have created many beautiful museums around the world..do you think that we are so stupid to do syirk..? Have u seen the Kufur stand worshiping their artifacts in the museum? ? In the name of “syrik” they have performed biggest syirkik by building more and more buildings for themselves to worship in their hearts as their mighty and successfull development..that they think represent their greatness.. They have to remember clearly..they are in no position to decide what belongs to all muslims. Not only that they impose VISA for all traveller who wants to visit the house of God.. But the end of the world is here..when pilgrimage no longer visit Mecca for the sacredness but only for shopping and to show off that which most expensive hotel they dwell in. 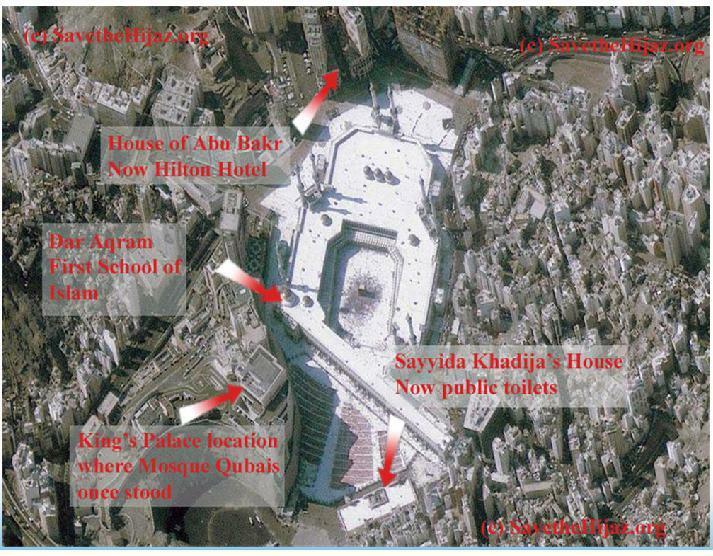 And Mecca is no different from any other big cities around the worl. I believe the KSA’s argument of going with the changing world is ridiculous. If they keep the historical sites of two cities namely Makkah and Medinah, I don’t think it will create any kind of backwardness in Saudi Arabia. I mean they have a whole set of other cities to turn into commercial centers. Are they saying that keeping two cities away from commercialism is going to create havoc in economy of Oil rich Saudi Arabia? Please, God gave you Makkah and Medinah as a trust. Please take into considertaion feelings of other Muslims before tampering with that trust. This is anotherway to increase the western economy stronger and which will have impact to Middle East economy. Government has big scholars and should decide under the Islamic Jurisdiction. i have been living in Australia and studying about the real Islamic concepts, which Include Quran, Hadit, Sharia Law, Tafseer, and Tawwheed. But there is a grater problem which lies in Australia. The Wahabi’s or the People who follow Ibn Ab’d Wahab have created a great organization calling as the real muslim, and are getting funded by the Wahabi’s of Saudi Arabia. These people are giving wrong daawa or information about Islam. So Brothers and sisters please make an appeal to the current leaders of Sunnat Jamat to visit Australia and remove people from being Gumrah (Misguided) . Why cant we defend Wahabi’s? Its because we Sunni’s r not united….. 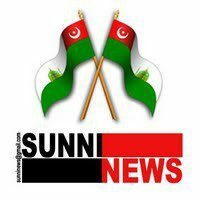 Please for the sake of our Islam we should keep r differences aside and finding fatwas against Sunnis…… Work against Wahabis…. 3 days back a Wahabi from Zimbabwe has come to sri lanka… All sunni bros and sisters r listenin to his conversation and speaches….. Everyday around 500 to 600 cars r parked outside… Where as when r Hazraths from India or Pakistan come they dont come… Why cant we Sunnis be united…. Our Sunnis dont spend time on their kids where they r going, doing, who they socializing with etc… They r into the worldly wealth which they don spend deen ul Islam…. Our youngsters r getting into wahabism daily cuz parents don give attention there kids imaan.. Ask a normal wahabi who is not that rich, he would give money without asking a word to a wahabi freind of his… But r sunni wealthy ppl ask 101 question if we sunni ask them for some donations….. Wahabis r well planned… They have man power plus they supported well financially… Pls. Consider Sunni brothers and sisters. Islam should be thought when the baby is in the womb! Home is the first school! Moms and dads pls take care of ur kids! One wonders, how these structures have survived for centuries, some over 1000 years old and in that time, so many intelligent, knowledgeable people on Islam chose to leave them as they were and yet now, the current power in the region chooses to destroy it all. Simple conclusion, the Wahabis are arrogant, self-righteous, and think they know better than all the history that came before them… It is simply outrageous. I am of this opinion that the Muslims do not worship the graves. Actually I do not speak and write about the Aqeeda of the people but I want to write and mention here that I have read some books in Urdu and English published by the Saudi government which are full of hatred and create the conflicts amongst the Muslims. Distribution of books by the Saudi government during Hajj is related to Wahabi Aqeeda too. Where is an Islamic country on the surface of this earth? Not a single one even not Saudi Arabia which is/has inherited government. An inherited government can never be islamic. And such country is defender of Islam, Ha ! Ha !! Ha !!!. Shame on those people who declare Saudi Arabia an islamic country. No doubt, Saudis have money and they have purchased the so-called Ulemas and the managements of the religious organisations only for prolonging their dictatorship. Day and night it is propagated that US armed forces are in Iraq, Afghanistan and at the border of Pakistan and these forces must quit these countries. But not a single word about the US armed forces stationed in Saudi Arabia, Kuwait, Qatar for years. All these countries are the pictures of same coin because of Aqeeda. Unfortunately, big quantities of hypocrites (the Munafiqs) are available throughout the world. Please dont be angry, if I say or write that the Alqaida, Taliban, etc are not only the productions of the USA but heavily financed by the Saudi government to give shelter to Wahabi Aqeeda. And what they are doing the whole world knows. I have many times heard that the evils go to the graves of any Buzurgh, Waleeallah, Saint, etc. Ok, but this is notable that these Buzurgh, Waleeallah, Saint, etc never said or told that the evils come to their graves. The same situation is that the evils do Hajj and Umrah and after performing these they do not change themselves. Allah Subaana Wa Taala and Hazrat Mohammad Mustafa Sallallaaho Alaihe Wa Aaliehe Wassallam are not responsible for these evils. Sooner or later Mekkah and Medinah will not be in the hands of Saudi-Wahhabi-Najdi-Dynasty, because enough is enough. SOON I WILL SEND SOME OF THE VIDEOS OF SAUDIS WHO FUCKED THEIR OWN WAHABI SISTERS AND MOTHERS , ENJOYING THEM . BECAUSE IN NOW A DAYS THERE ARE SO MANY DIVORCE CASES ARE OBSERVED IN KINGDOM , IT WILL LEADS TO WOMEN WAHABI HOMOSEXUALITY IS PRESENT. All of the comments I see so far in response to this so-called news item making outrageous allegations against the Saudi Government are highly sentimental, biased and unintelligent. As Muslims we were taught first and foremost by the great prophet(S.A.W) to give our fellow believers the benefit of doubt, and even when we find him wanting, to try and find excuses for him. How about when that fellow believer is the best and closest example of and Islamic government presently on the surface of the earth?.Now I do not see that being exhibited here. All I can see here are sentimental and highly un-educative commentaries by either outright liars or people who know next to nothing about the history of the Saudi Kingdom and how they come to establish true Islam, devoid of idolatory practices, in Saudi Arabia. No body among all the writers tried to find out the Saudi Government side of the story. instead you are all willing to believe one obscure Dr. Alawi (a very wrong name for a genuine Muslim) working for a hideous “research”organisation, located in LONDON! Khaan-e- Kabah’s area is expanding, outside area of Khaan-e- Kabah are demolishing and merging in Khaan-e- Kabha by that at most people pray. We know from history it was expanded many times. It is good for Muslims. Barailwiyon ka Aqeeda hai ki Allah tala aur Nabi (saw) dono har jagah Haazir (present) aur Naazir (dekhnewale) hain. Jabki Quran se Allah tala ka har jagah naazir hona sabit hai lekin haazir to har jagah Allah tala bhi nahi hain. Rahman (Allah) arsh par mustawi (baitha) hai. Uski kursi zameen aur aasman ko ghere hue hai.. In aayton se sabit hota hai ke Allah tala har jagah haazir nahi hai. Agar Allah (swt) har jagah haazir hote to Musa (as) kyon farmate mai tujhe dekhna chahta hu, aur Allah apna tajalli kyun karte agar Allah wahan pahle se hi maujud thha. Balke Allah Arsh par mustawi (baitha) hai. Arsh par mustawi hone ki kaifiyat hame malum nahi, jis tarah Allah ke Alla (swt) ki shaan ke layeq hai usi tarah wah Arsh par mustawi hai. Hamari aqal is ko nahi samajh sakti. Allah farmate hai ke Qayamat ke din Allah (swt) tamam Rasoolon se poochhe ga.
Agar Nabi (saw) har jagah haazir hote to ye nahi farmate mujhe kuchh khabar nahi. In Aayton se sabit hota hai ki Nabi (saw) paidayish se pahle kahi haazir nahi thhe na hi naazir thhe aur wafaat ke baad bhi kahi haazir naazir nahi hain.